Jamming will be even more fun for your rocker in one of these guitar Personalized T-Shirts. 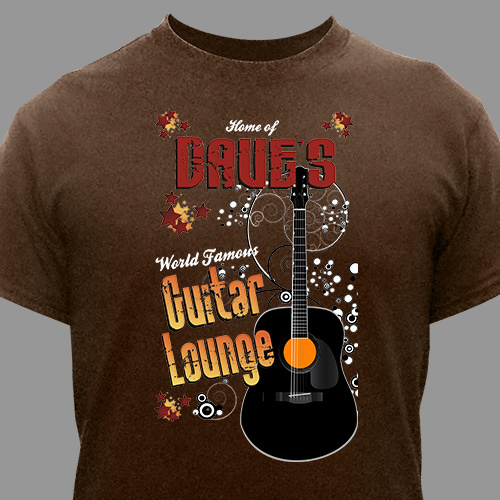 Our guitar Personalized Shirt is made of 100% preshrunk cotton, comes in delicious chocolate brown and can be customized with any name. It's machine washable and available in adult sizes S-3XL. We're not going to string you along: This guitar lounge t-shirt with name is the perfect gift for any rock 'n' roll enthusiast. Great tee shirt...sent to grandson hopefully he reads washing instructions. I just got this in the mail today. I love it! I got it along with the metal wall mount (that was great too) with same design for my boyfriend's birthday. Not only did he love it but our boys loved it as well. Great product. First ever time purchasing anything on this site and Costumer rep was very nice, friendly, knowledgeable and respectful. Great experience all away around!